A hello from Corrie and Jay in the states and a huge thank you! While Jay and I struggle to find any words that can convey how grateful we are to each of you for the magic that was our African adventure – here is a snippet that sums it up, in part. A special thank you to you Gavin – just incredible! This was our first trip to Africa and it could not have been more picture perfect. From the exquisite attention to details, big and small, to sharing your infectious passion for all things wild, Gavin, you could not have done a better job! All travel was effortless on our end because it was so well handled and any special requests were addressed beautifully. More than all the logistical details that do indeed go into the makings of a fabulous trip, we truly enjoyed being introduced to this “new part of the world” by someone who obviously loves it so. The South African landscape was initially so huge and so beautiful that it nearly overwhelmed us, yet it became real and vivid and so alive as you helped us to distinguish dots on the horizon from red hertebeests and fuzz in the sand from a baboon spider’s lair. With each spotting (so so much to see – so many birds and beasts!) and each fact-filled or humor-laced story we began to grasp the spirit of Madikwe and the Kalahari. Your infectious enthusiasm and your intuitive way of guiding and teaching transformed a trip to Africa into a trip of a lifetime that exceeded our expectations in every possible way. We feel so fortunate to have had you as our guide! Many many thanks go you and to Dylan for perfect behind-the-scenes and on-the-scene planning and execution and to Meg North and her team at Brownell Travel. Though we’ve not been home a month yet, I find myself already dreaming up ways to get back to South Africa. Gavin, you made it so easy. Traveling with you from place to place was seamless and each one was fantastic. While we were all impressed with the knowledge of the local guides, your life experiences and diplomacy in working with the teams at each preserve was invaluable. Gavin, you were right. The love affair has begun and Africa will forever be in my heart. I know there will be many return trips in my future. Comments Off on A Big Thanks! I can not thank you enough for the fabulous 3 weeks we had in East Africa. It was truly a trip of a life time! Dylan- the itinerary, accommodations, and just the entire agenda was spot on! I do not underestimate the amount of work and detail that you are gifted and so totally capable of! And Gavin you are truly the utmost “guide” helper, host, friend, photographer. Your patients are amazing. Especially for dealing with me:) Because you are so good, I have Ethiopia on my agenda and will start studying the birds soon so I have a visual concept of bird and name. Might want to consider being “difficult.” :))Also, thanks a ton for your help and understanding with Bill and his medical situation. Life is hard in the bush and hard in the “city.” As I am typing this I hear Bill with his usually long hard “sigh” so please let Tracy know it is habit and not health! Hope you hear from Nelis so I can get a recipe or two. You guys are wonderful and anyone I meet that is considering a safari I will promote you. I am not a sales person but with our experience it will be a natural passion given what we experienced! WOW .. you really put on quite a trip for us and I find myself going to the video tape in my phone to explain how close we all got to the animals. The safari eclipsed all expectations thanks to you and your keen eye. Your explanations of what was going on in the animal kingdom made it all come together. Susan and I are convinced you are the friendliest guy on the Safari trail. Everyone seems to be a mate wherever you go. Your way of shepherding us through any situation was particularly smooth. So thank you, thank you for an unforgettable trip! Gavin, you really put on quite a trip for us and I find myself going to the video tape in my phone to explain how close we all got to the animals. The safari eclipsed all expectations thanks to you and your keen eye. Your explanations of what was going on in the animal kingdom made it all come together. Susan and I are convinced you are the friendliest guy on the Safari trail. Everyone seems to be a mate wherever you go. Your way of shepherding us through any situation was particularly smooth. Lots of great wildlife viewing. I can only think of two animals we didn’t see (Rhinos and Cheetahs – neither of which we expected to see in these camps). The highlight had to be watching the lions pursue Cape Buffalo in Duba. We then got to see other lions in Kings Pool dragging a recently killed Cape Buffalo under some trees. We also had a funny encounter with a hippo (thank God it was funny and not frightening). Lots of great birds. The three camps worked out well, so did the sequencing. Toss-up between Duba and Kings Pool as to which one we liked best (for different reasons). I summed it up by saying we came to Botswana for the animals and the scenery, but we fell in love with the people! The staff and the guides in all three camps were terrific. Thanks for your help and encouragement to visit Botswana. I’m already working on our next trip. Wilson Airport is off Langata Road, and after checking in and having our luggage weighed (including our hand luggage) we soon were boarded on a Grand Caravan bound for Sarara, via Nanyuki. The airstrip faces the mountain, so one has to land facing into it, and the camp lies beyond the strip. Approaching Sarara Camp, Wamba Hills. Phillip was there to meet us. He is a local Samburu, educated in English, but dressed proudly in his traditional colours and attire. It’s a short drive to camp, where Katie and her staff are there to greet us. Lunch was very welcome. That afternoon we took a short drive. 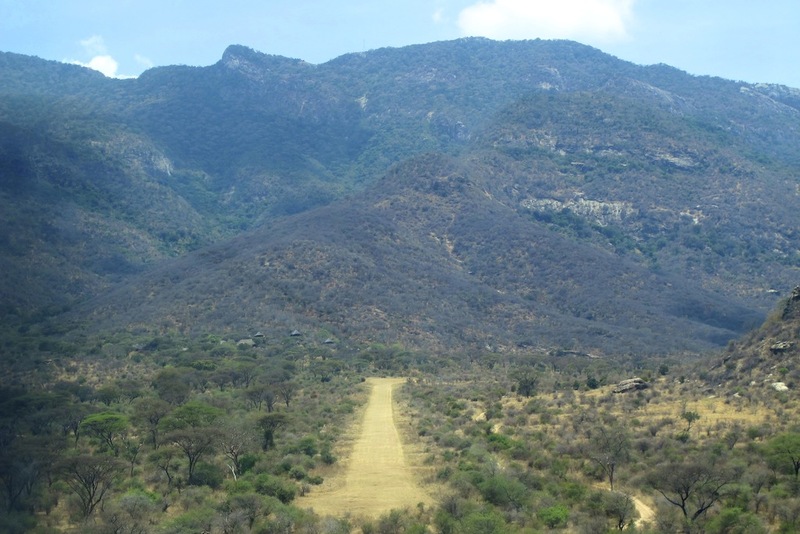 The Wamba Hills are just south of the Mathews Range and Sarara Camp is located at the base of the Wambas’, on the northern foothills. Samburuland is harsh, dry and covered in Acacia’s, with greener veins of riverine woodland marking watercourses which flow only when the rains fall. If they happen. Droughts are frequent, and devastating to local tribesmen and their beloved flocks of sheep, goats and Zebu x Borana cattle. In bad years young elephant and other game die off as well. 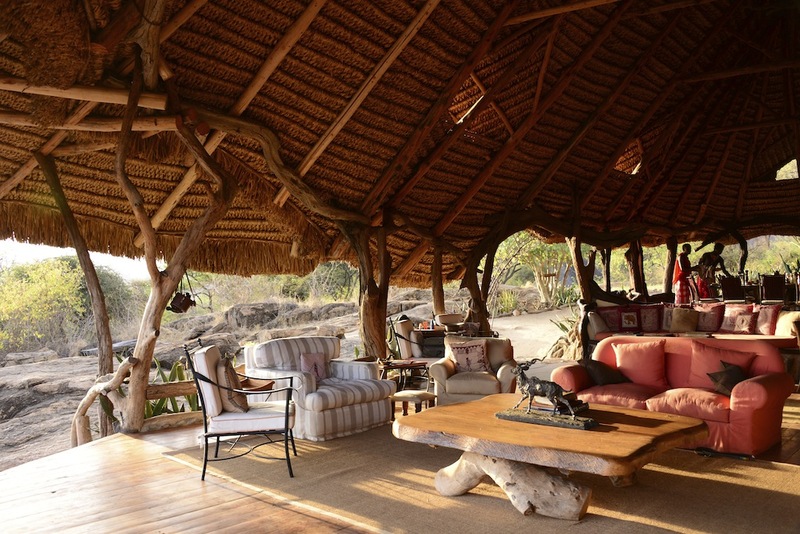 The camp was established as a conservation milestone with the Samburu community and Piers Taylor and Ian Craig. Ian Craig has become one of Kenyas most pro-active conservation figures and is famously known for his ground-breaking efforts at Lewa and Ol Pejeta Conservation areas, and their respective communities. 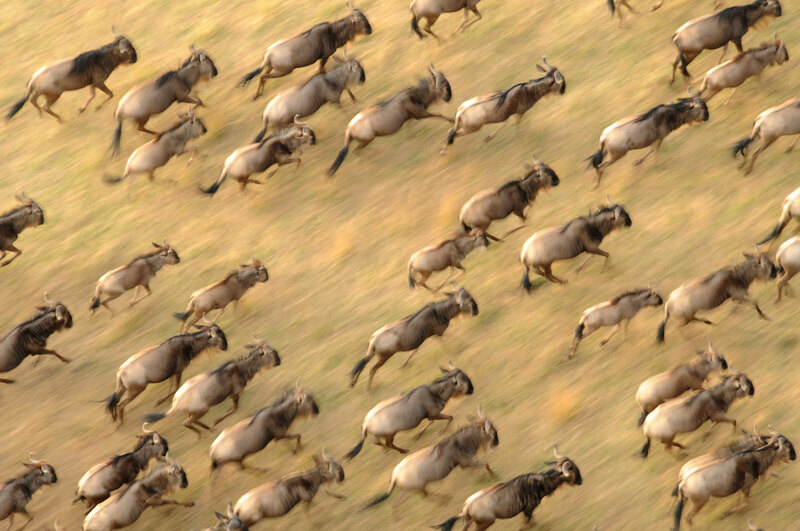 Sarara is the cornerstone of the Nyamunyak Trust, which is part of the Northern Rangelands Trust. Six luxury tents have been built along the side of the hill, with a simple but very effective ‘lodge’, and a rock pool. The setting and infrastructure blend with the local environment perfectly. 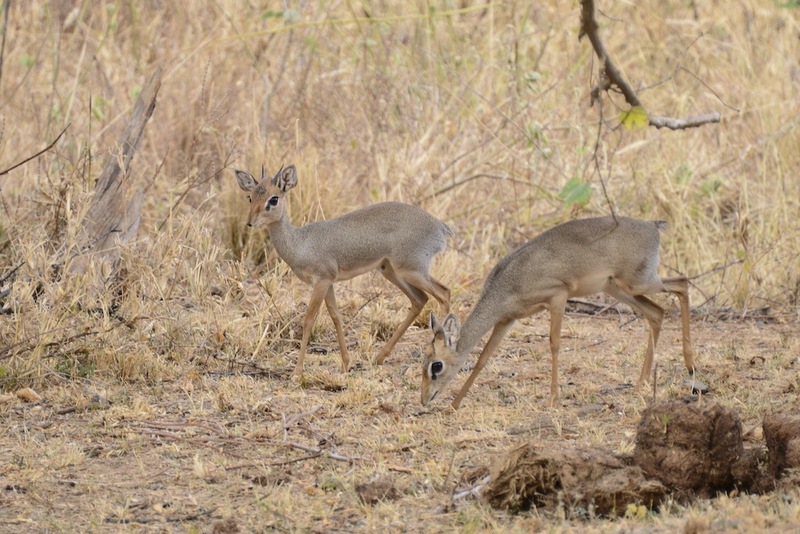 Our first drive that afternoon we saw gerenuk, impala, numerous Kirks’ dikdik, reticulated giraffe in the distance, vulturine guineafowl and a bounty of other birds too. 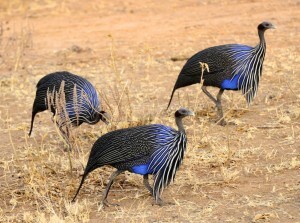 Vulturine Guineafowl feeding in the dry scrub. 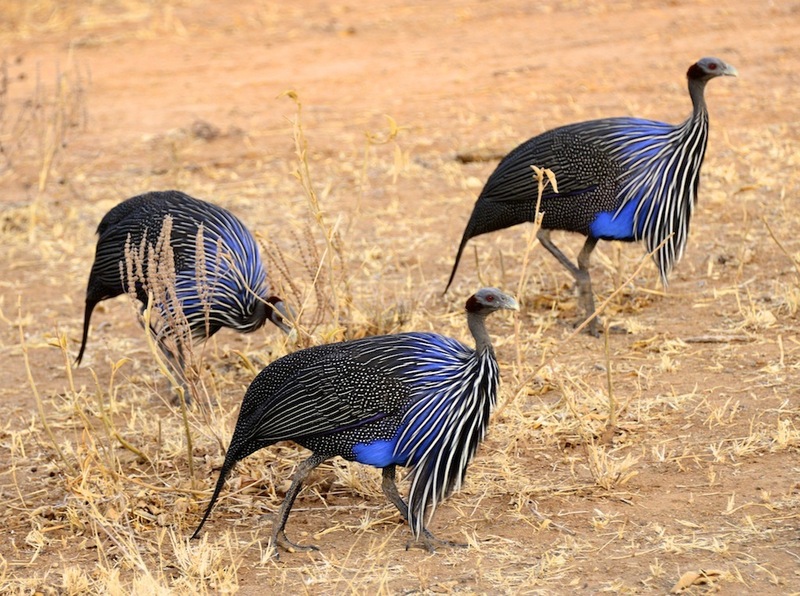 Splendid birds.